Natal Sharks’ eighthman Gary Teichmann played 42 tests for the Springboks, leading the national team on 36 occasions and establishing a reputation as a hard-working, committed, courageous and fair player throughout the rugby world. Teichmann’s humility was one of his most impressive characteristics. He was a quiet leader, leading by example rather than by talking, but his example spoke volumes and it was obvious that this approach worked for the teams he led. 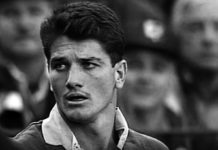 While he was captain of the national team, the Springboks won 26 of 36 matches, including a world record equalling 17 tests in succession. These wins included victories over New Zealand, Australia, France, England, Ireland, Wales and Scotland away from home. They also included a first-ever Tri-Nations title for South Africa in 1998 when they swept Australia and New Zealand. There was a record win of 61-22 over the Wallabies in 1997 and a 96-13 pasting handed out to Wales in the same year. Ireland were blanked 33-0, Scotland crushed 68-10 at Murrayfield, France thrashed 52-10 in Paris and England outscored by four tries to one in a 29-11 victory at Twickenham. Through both wins and losses Teichmann seemed to be an almost reluctant leader; on the field he led from the front, but off the field he shied away from the public eye as much as the media in South Africa would allow him to do so. He, however, was always sincere towards both his team and the opposition and the respect given to him was also sincere because of this. Teichmann, never a leader on the rugby field at school level, was pushed into the captaincy role at Natal by the province’s highly-respected coach Ian McIntosh. That proved to be an inspirational move for both the Sharks and for South Africa. He represented the Sharks in 144 matches in all, during a period in which the Sharks became South Africa’s team of the 1990s with four Currie Cup victories and the best results in the Super 12 of the four South African regional sides. In 1998 he led the Sharks to the semi-finals of the Super 12, where they were beaten 36-32 by the eventual champions, the Canterbury Crusaders, in Christchurch. In 1999 the Sharks finished seventh. With Teichmann in charge, the Sharks won the Currie Cup in 1992, 1995 and 1996, and finished runners-up in 1993 and 1999. In 1994, the Sharks lost to Queensland in the final of the Super 10. When Teichmann was sacked as leader of the Springboks in July 1999, it marked the beginning of the end of his career in South African rugby. His axing was a controversial decision, but typically he refused to get involved in any slanging matches or accusations that other people were making in the media. Instead, he responded with inspired leadership of the Sharks to guide the Natalians to the final of the Currie Cup. 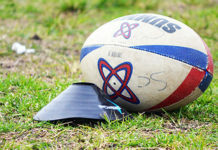 He had earlier announced that he would be retiring after the match and would continue his rugby career with Newport in Wales. A capacity crowd packed the stadium, King’s Park, to watch the fairytale ending to the career of one of their favourite sons. It didn’t materialise as the Lions dumped the home team 32-9 and thus ended Teichmann’s career in the black and white. He then spent two seasons with Newport as the club became one of the powers of Welsh rugby and enjoyed some success in European competition. Once again, players, supporters and administrators had nothing but praise for their club captain. He helped the black-and-ambers to their first piece of silverware in 24 years when he led the side to a 13-8 victory over Neath in the final of the Principality Cup, his final match before retiring from the game. A banner proclaiming “And on the eighth day, God created . Teich!” summed up the feelings that the fans had towards the gutsy eighthman. One of Teichmann’s regrets, and that of many fans, remains that he never participated in a World Cup. 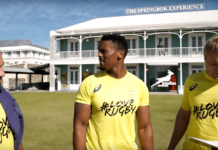 He first played for the Springboks in September 1995, after the World Cup that was held in South Africa that year, and then was controversially dropped with the 1999 World Cup in sight. Former coach Nick Mallett has since admitted that with the benefit of hindsight, the dropping of Teichmann was a big mistake. To this day Teichmann’s example remains one of the finest for younger and older players alike to follow. He proved that there is room for gentlemen in the game of rugby.